Many years ago when I was starting out on my writing career I did a correspondence course with The Writers’ Bureau. For one of my first assignments I wrote a short article about Birmingham Botanical Gardens and my tutor suggested I send it to This England. I did and they published it in their Cornucopia section. I got paid and felt like a real writer. This is a good market to aim for if you want to have a go at non-fiction writing. 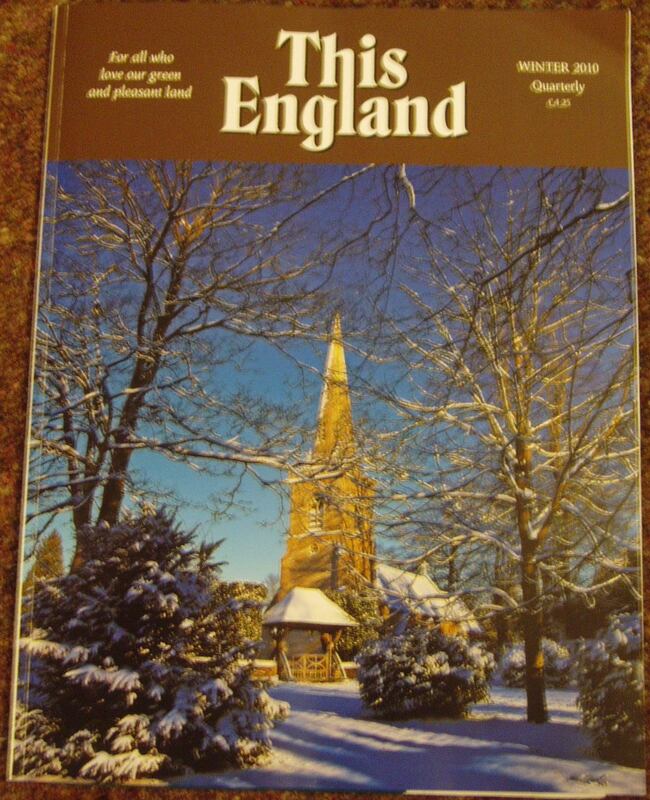 This England is a glossy, quarterly magazine for “all who love our green and pleasant land.” It contains illustrated articles on English history, traditions and towns and is “read by two million patriots all over the world”. The Cornucopia section consists of several short pieces, some written in house and some supplied by freelances. They range in length from around 250 to 400 words and cover topics such as the centenary of a Brighton cinema, Digswell Lake near Welwyn Garden City and recyling at Chatsworth House. I’ve found that the easiest pieces to get accepted are those based on an anniversary of some kind, e.g. 50 years since the birth of X, 75 years since building Y was opened. The magazine’s Guide for Contributors states that articles should be “about our country’s people and places – its natural beauty, towns and villages, traditions, odd customs, legends, folklore, surviving crafts, etc. ” Short poems (6 to 24 lines) that are meaningful rather than clever are also accepted. The best way of getting a feel for the style and content of the magazine is get hold of a copy (it is available in WH Smith and other good newsagents). Payment is £25 per 1,000 words plus a contributor’s copy of the magazine. This entry was posted on December 6, 2010, 12:00 pm and is filed under Markets, Writing. You can follow any responses to this entry through RSS 2.0. You can leave a response, or trackback from your own site.